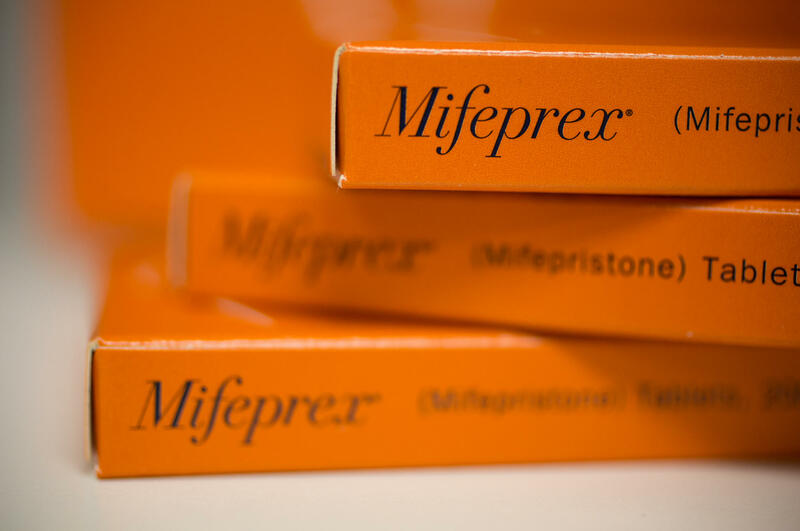 Mifepristone, sold under the brand name Mifeprex, causes a woman to have what's essentially a very heavy period. When Kirstin Herbst found out she was pregnant last winter, she and her fiancé were overjoyed. But when she went to the doctor for her first ultrasound, she found out she was having a miscarriage. Her doctor prescribed a medication called misoprostol, which helps the miscarriage to pass. But the misoprostol didn't work right away, and Herbst needed to take another dose. Herbst was optimistic when she became pregnant again this past summer. When she went in for an ultrasound, she learned she was miscarrying again. Sitting next to pregnant women in the waiting room of the clinic, she says, was devastating. "I remember hating being out in public," says Herbst, who lives in Toronto. "I definitely preferred to curl up on my couch and just cry when I needed to cry." For her second miscarriage, Herbst's doctor prescribed a regimen that the latest research shows is more effective. She took a medicine called mifepristone and then took misoprostol the next day. The combination worked much better, and Herbst was able to pass the miscarriage at home. "You just want to sit at home and watch Netflix and be as comfortable as possible," she says. But for women in the U.S., it is more complicated to get the two-medicine approach than it was for Herbst in Canada, because mifepristone is known as the "abortion pill." Mifepristone causes a woman to have what's essentially a very heavy period, and there is a small risk of excessive bleeding. It's been heavily regulated since it was approved by the Food and Drug Administration for medication abortions in 2000. Government restrictions make it difficult for women who are miscarrying to get it. In June, the New England Journal of Medicine published results of a study that showed the combination of mifepristone and misoprostol was more effective than misoprostol alone to help women expel a miscarriage, or what's known as an early pregnancy loss. That's when a pregnancy is not viable in the first trimester. Before these findings were published, women who were miscarrying usually had three options: a surgical procedure to remove the miscarriage, misoprostol alone, or waiting for the miscarriage to pass on its own. Research shows that women tend to prefer the surgery or medication, but since a single dose of misoprostol fails about 30 percent of the time, many women are forced to return to their doctors for a second dose or to get the surgery. "It ends up adding insult to injury," says Courtney Schreiber, an OB-GYN in the Department of Obstetrics and Gynecology at the University of Pennsylvania and the lead author of the New England Journal study. "The misoprostol alone has really not been a therapeutic intervention." In Schreiber's study, which followed 300 women who were miscarrying, the combination of mifepristone and misoprostol was more effective in helping patients expel the miscarriage. The overall success rate was 90 percent for patients who took both medications, and 76 percent for those who who got misoprostol alone. "It offers them a sense of control over their own bodies and their own process when they feel that they've already lost an element of control," Schreiber says. 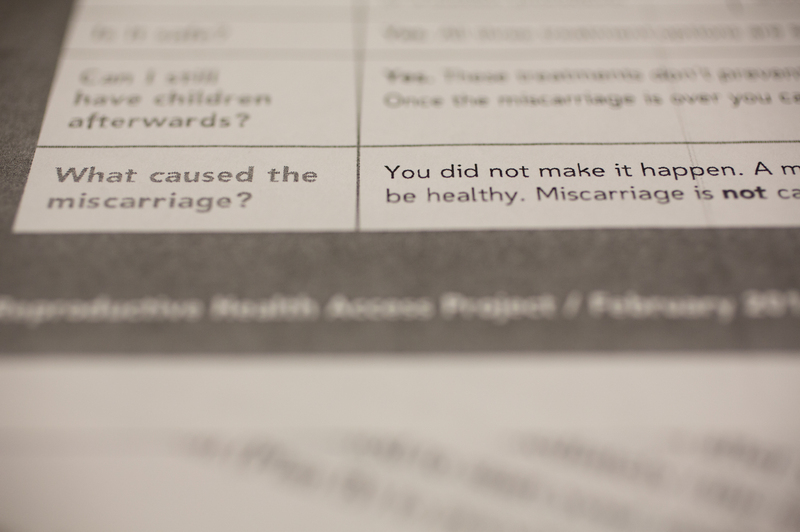 A handout about miscarriages provided to patients at the University of New Mexico Center for Reproductive Health in Albuquerque. Miscarriage is common. The Centers for Disease Control and Prevention estimates that over 1 million American women have a first trimester pregnancy loss each year. The American College of Obstetricians and Gynecologists now officially recommends the two-drug regimen. Yet access to mifepristone is restricted in a way that makes it difficult for physicians to prescribe. "We clearly need to provide mifepristone," says Dr. Karen Meckstroth, director of the Women's Options Center at the University of California, San Francisco. "How do we get it?" Mifepristone is regulated by the Food and Drug Administration under what's called a Risk Evaluation and Mitigation Strategy, a designation the agency uses for extra safety oversight that affects how a medication is distributed. But most physicians and the FDA itself consider mifepristone safe; the FDA approved the medication for use in 2000. The REMS is in place, abortion-rights advocates say, for political reasons: It limits access to a medication commonly used for abortion. The REMS restrictions mean that mifepristone is not available in commercial pharmacies; a doctor can't prescribe it for pickup at a CVS or Walmart. Instead, a woman must travel to a clinic or hospital that is designated as a mifepristone supplier under an agreement with the drug's manufacturer, Danco Laboratories. The patient must also sign a form that says she understands what the medication is for and understands its risks. In Canada, where Herbst took mifepristone for her miscarriage, women can get their prescriptions for mifepristone filled at pharmacies like any other medication. No definitive data exist on the number of clinics in the U.S. that stock mifepristone, according to Rachel Jones, a researcher with the Guttmacher Institute who studies the drug, but academic medical centers and clinics that provide abortions tend to be the places where doctors can prescribe it. Danco representatives say they can't provide information on the number and types of sites that stock mifepristone because of confidentiality agreements. The restrictions on mifepristone mean that most doctors aren't able to prescribe it for women who are miscarrying. That can leave these women in the lurch. 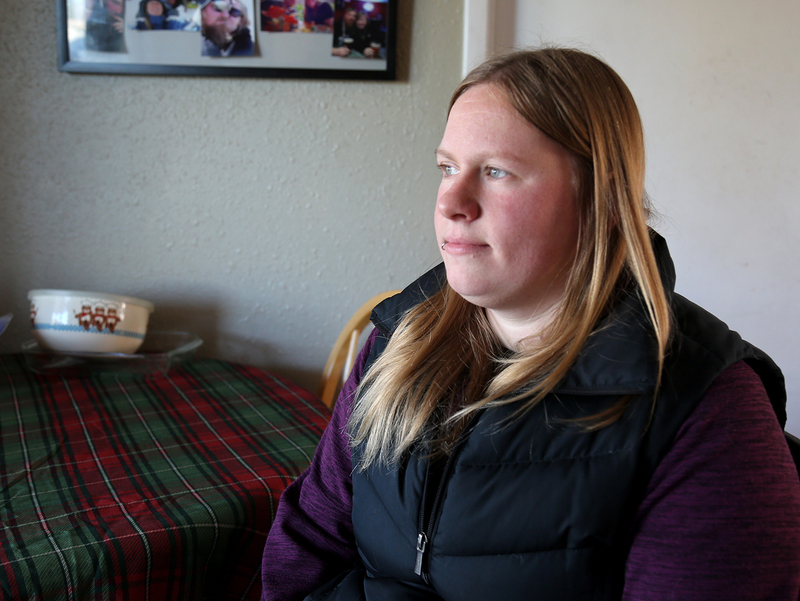 Take Allison Wray, an office manager for a construction company in Vancouver, Wash., who has been trying to get pregnant for the past several months. She was diagnosed with a miscarriage in November, and she wanted to avoid surgery. Her doctor prescribed only misoprostol for her. The misoprostol didn't work, and she had to return to her doctor after about five days without passing the miscarriage. That week, Wray says, her doctor's office had just started to stock mifepristone, so she then tried the combination regimen. "It started to progress much quicker than the misoprostol ... which was really, like, a relieving experience," Wray says. "Everything kind of just feels better." In a second round of treatment after a miscarriage, Allison Wray, who lives in Vancouver, Wash., got mifepristone. She says it was "a relieving experience." But for some physicians who oppose abortion, the restrictions on mifepristone may provide "an appropriate pause," says Dr. Christina Francis, an OB-GYN and chair of the American Association of Pro-Life Obstetrician Gynecologists. She says the restrictions on mifepristone help ensure women who take it are under the care of qualified physicians who understand how to use the medication. "I don't see it as imposing an undue barrier on physicians," Francis says. Francis often cares for women who are miscarrying and prescribes only misoprostol for women who want to avoid a procedure. She sometimes sends them home with several doses of misoprostol, so they can avoid returning to the doctor if the first dose doesn't work. Francis says she thinks the New England Journal of Medicine study was too small to prove that mifepristone in combination with misoprostol is effective for miscarriage management. She says she hasn't prescribed mifepristone for miscarriages and doesn't plan to change her practice based on this study, though she might reconsider if additional research replicates the findings. For some doctors eager to use mifepristone in the treatment of miscarriage, however, prescribing the medication requires some creative thinking. Dr. Lisa Hofler runs a University of New Mexico clinic that stocks mifepristone but doesn't routinely provide prenatal care. She and her colleagues can schedule same-day appointments for women diagnosed with miscarriages elsewhere. In Albuquerque, N.M., for example, women's health providers have developed a special protocol that helps women who are miscarrying get mifepristone. "We immediately ... saw this as a superior way of providing care," says Dr. Lisa Hofler, the chief of family planning at the University of New Mexico School of Medicine. Hofler runs a clinic that stocks mifepristone but doesn't routinely provide prenatal care. 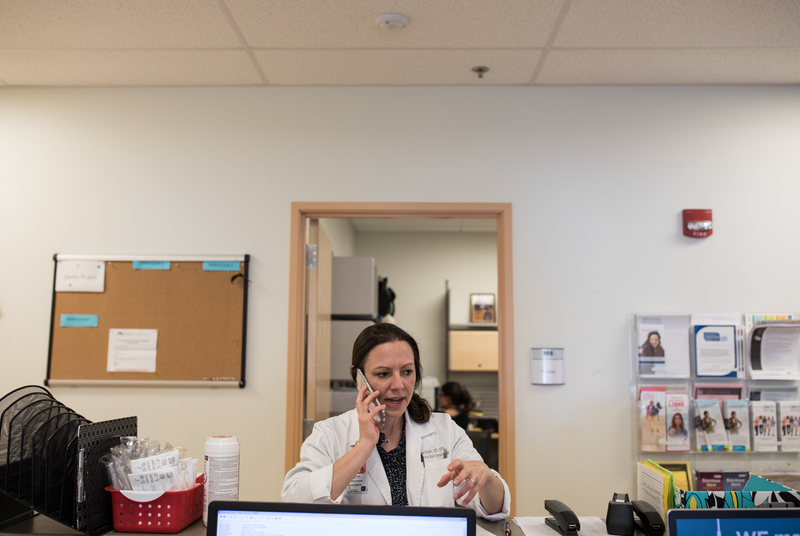 Since many miscarriages are discovered when women get their first ultrasound in pregnancy, she and her colleagues have developed a workflow that lets women who are diagnosed during a prenatal visit elsewhere get same-day appointments for mifepristone in the clinic. Other women's health providers are working to make mifepristone available in the locations where miscarriage is diagnosed, like primary care offices and emergency rooms. But because many think of mifepristone as the "abortion pill," it can be difficult to get it stocked — even when its intended use is for miscarriages. Kristyn Brandi, an OB-GYN at Rutgers New Jersey Medical School in Newark, says she currently can't prescribe mifepristone to her patients, even though she practices at an academic medical center that gets referrals from across New Jersey. "Some people are worried about the politics around the medication and how that could create repercussions for the hospital," Brandi says. Brandi, who started in her position this September, says she immediately started the application process to get mifepristone added to the list of available medications at her hospital. It was approved in December by a preliminary committee that oversees medications, but it's still not available for use. Brandi is optimistic that will change in the coming months. While Hofler is happy she can provide women with care that is backed by research, she says women shouldn't have to go to special clinics to get mifepristone. She's hopeful that a change in access will reduce the shame women feel about both miscarriage and abortion. "People can talk about miscarriage, but it's stigmatized in the undercurrents," Hofler says. "Society still views this as a failing of the woman." Meanwhile, activists are trying to make mifepristone more accessible by eliminating the FDA's requirement for additional oversight. Multiple medical societies — including ACOG, the American Academy of Family Physicians and the American Medical Association — are working to overturn the REMS classification of mifepristone. In October 2017, the American Civil Liberties Union sued the FDA on behalf of Dr. Graham Chelius, a family physician in Kauai, Hawaii, who says he would like to prescribe mifepristone. His hospital doesn't stock the medication and it isn't available on the island. "The FDA restrictions on mifepristone are motivated by politics, not science," says Julia Kaye, the lead attorney in the ACLU's lawsuit. Several professional societies — including the California Academy of Family Physicians — are also listed as plaintiffs in the case. The ACLU is in the midst of negotiations with the government about technical aspects of the case, Kaye says, and she doesn't expect arguments to begin for at least several months. "Restrictions continue to be necessary to ensure the safe use of the drug," an FDA spokesperson wrote in an email statement to NPR. Kaye says the ACLU's case is not currently affected by the new research about mifepristone's use in miscarriage, but she is hopeful more widespread use of the medication will decrease stigma. Herbst, who took mifepristone and misoprostol for a miscarriage this past summer, says she still feels sad about the loss of her pregnancies. She is hopeful she'll have a baby in the future. And meanwhile, she says she feels sympathy for women in the U.S. who aren't able to get the medication that made a difficult time for her a little bit easier. "It's already one of the hardest things you'll deal with," Herbst says. "Why make it harder? I hurt so much for people who are pregnant in the States right now." Dr. Mara Gordon is the NPR Health and Media Fellow from the Department of Family Medicine at Georgetown University.